The original farmhouse dates from before 1800, with an unconfirmed date of 1740. It has all the difficulties of colonial construction, including being too close to the road, a rock foundation, horsehair, hand cut lath, no insulation, etc. The post and beam barn was built about 1874 with money obtained after some of the farm land was appropriated by the Eminent Domain Act of 1852 for the creation of a railroad bed, now Route 125. 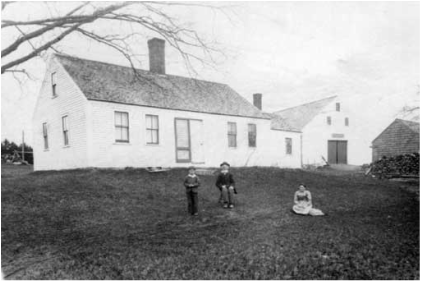 The property was cleared, then run as a dairy farm by the Piper family from 1845 to 1957. It was sold by Annie Piper to the present owner in 1980 on a handshake. The sixth generation of the Piper family lives across the road. The house when we bought it, in 1980. The property was a 37-acre dairy farm that had been abandoned for about 40 years. The first years were clearing out the acres of poison ivy, and the pucker-brush. 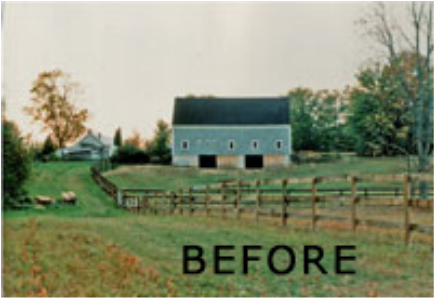 Work on the farm as a landscaped project started about 1987. Virtually all of the work has been done by the two founders. The scrub growth and grown-in fields were cleared, access roads were established, and the woods were thinned, trimmed, and managed under forester and arborist advice. Bed by bed, gardens were eked out. In 1991, a wildlife pond was added. 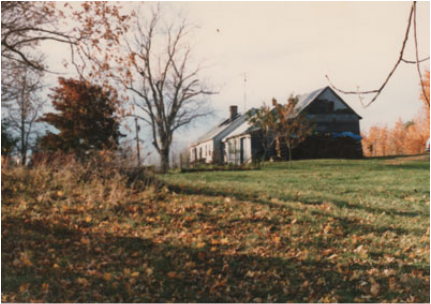 In 1999, a family room was added to the original house, but the original house itself and the outbuildings (including the three-hole outhouse) remain. Now, about 2/3rds of the property is garden. 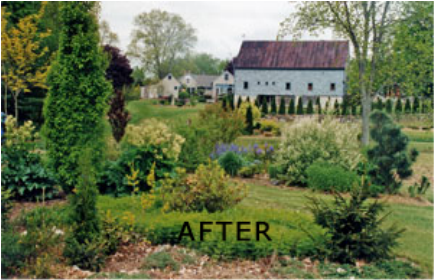 The garden includes many structural elements such as paths, an espaliered fence, an arborvitae hedge, architecturally interesting rocks, pergolas, and garden art. The beds have exceptional plant varieties, often started as seedlings, including many unusual specimens of perennials, trees and shrubs.